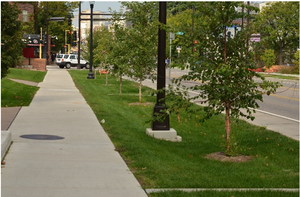 Green Infrastructure: Infiltration practices can be an important tool for retention and detention of stormwater runoff and treatment of pollutants in stormwater runoff. If the practice utilizes vegetation, additional benefits may include cleaner air, carbon sequestration, improved biological habitat, and aesthetic value. This page provides a discussion of construction specifications for infiltration basins, trenches, and underground infiltration, including a construction sequence. An easement is a legally binding agreement between two parties, and is defined as ”a non-possessory right to use and/or enter onto the real property of another without possessing it.“ An easement is required for one party to access, construct, or maintain any feature or infrastructure on the property of another. Easements can be temporary or permanent. For example, temporary easements can be used if limits needed for construction are larger than the permanent easement footprint of constructed features. Having an easement provides a mechanism for enforcement of maintenance agreements to help ensure infiltration practices are maintained and functioning. See an example access agreement. Installation of underground infiltration pipes. Construction of infiltration practices incorporates techniques and steps that may be considered nonstandard. It is recommended that construction specifications include project pretreatment devices, construction sequencing, temporary and permanent erosion control measures, excavation and fill, grading, soil decompaction, material specifications, and final stabilization. All of these topics are addressed in further detail below. 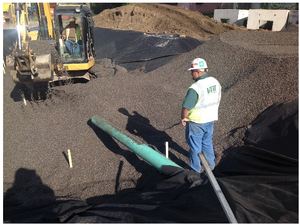 Additional specifications for items applicable to infiltration practices can be found in the Minnesota Department of Transportation’s (MnDOT) Specifications for Construction. The current version of this resource was completed in 2016. Below is a list of MnDOT sections that may be helpful when writing project specifications for infiltration practices. Pretreatment inlet structure to dry swale with check dam contains sump and skimmer (top), dry swale with check dam inlet pipe, downstream of inlet structure (bottom). Photos courtesy of Barr Engineering. During construction, it is critical to keep sediment out of the infiltration device as much as practicable. Utilizing sediment and erosion control measures will help to keep infiltration areas from clogging. As soon as grading is complete, stabilize slopes to reduce erosion of native soils. Protect temporary soil stockpiles from run-on and run-off from adjacent areas and from erosion by wind. Sweep as often as required if sediment is on paved surfaces to prevent transport offsite by tracking and airborne dust. All sediment and erosion control measures must be properly installed and maintained. When sediment build up reaches 1/3 the height of the device, action is required, such as removing the accumulated sediment or installing additional sediment controls downgradient of the original device. Link here for more information. It is REQUIRED that future infiltration locations not be used as temporary sedimentation basins unless 3 feet of cover is left in place during construction. If the infiltration area is excavated to final grade (or within 3 feet of) it is REQUIRED that rigorous erosion prevention and sediment controls (e.g., diversion berms) are used to keep sediment and runoff infiltration away from the infiltration area. Preventing and alleviating compaction are crucial during construction of infiltration practices, as compaction can reduce infiltration rates by increasing bulk density of the soil. The infiltration area should be marked with paint and/or stakes to keep construction traffic from traveling in the area. Inspections before, during, and after construction are needed to ensure infiltration practices are built in accordance with the plans and specifications. It is recommended that onsite inspectors are familiar with project plans and specifications to ensure the contractor’s interpretation of the plans are consistent with the designer’s intent. The inspectors should take frequent photos and notes of construction activities and features as work progresses and at all critical points (such as immediately prior to backfilling). They should check dimensions and depths of all installed materials. All materials and products should be verified or tested for conformance with the specifications. Examine the areas for performing earthwork and determine that conditions are satisfactory to proceed, or to correct all unsatisfactory conditions prior to starting work. Arrange to locate, mark, and protect all existing utilities and underground facilities in the areas of work. 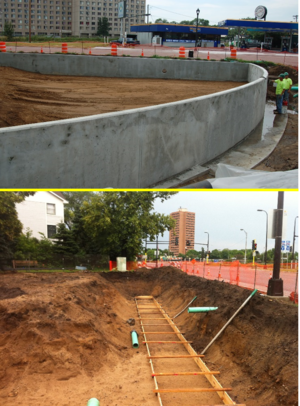 Partial excavation for retaining wall, infiltration basin is not excavated (top), retaining wall constructed, infiltration basin is fully excavated and has infiltration media in place (bottom). Photo courtesy of Barr Engineering. Sub-cut the infiltration area as shown on the plans. 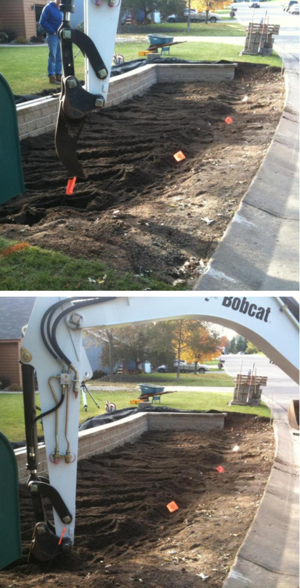 Where possible, excavation should be performed with a backhoe and work should be done from the sides and outside the footprint of the infiltration area to avoid soil compaction. If it is necessary to work in the infiltration area, only low ground pressure tracked equipment should be allowed to complete the work. Rubber tire equipment should be strictly prohibited within the infiltration area, unless working from pavement outside of the basin or trench. The contractor should start the work at the far side of the trench or basin and work their way out. Warning: It is REQUIRED that infiltration systems not be excavated to final grade until the contributing drainage area has been constructed and fully stabilized. Example of subsoiling and incorporation of compost and sand. Note the equipment is kept out of the practice. Subsoil decompaction is required in all infiltration areas. Decompact subsoil with a backhoe ripper attachment or other approved method to a depth of at least 18 inches below subgrade in all locations indicated on the drawings. Also known as soil loosening or soil ripping, this technique has been shown to increase infiltration and reduce compaction from construction activities. For more information on alleviating compaction, link here. Subsoil infiltration testing is recommended prior to the placement of any infiltration media. After the subsoil is decompacted, test the infiltration area to verify the assumed infiltration rate and that the infiltration area will drain dry within 48 hours. This can be accomplished by performing double ring infiltrometer tests (ASTM D3385) in the bottom of the basin, or by filling the infiltration basin and timing how long it takes to drain from maximum water depth to dry bottom. The measured infiltration rate should equate to double the designed infiltration rate. If the basin is filled with water to perform this check, be sure sediments are not being washed into the basin during filling. If sediments are washed into the basin, they need to be removed prior to placing infiltration media. If the basin does not drain dry within 48 hours, 24 hours for special waters, or the infiltration rate is slower than twice what was assumed in the design, additional soil loosening or modification may be necessary. Information on soil testing can be found here. Infiltration media being placed in infiltration area with tracked backhoe. Photo courtesy of Barr Engineering. Soil test results should be provided to the designer a minimum of two weeks prior to delivery of planting soil to the site. Submitted test results should include gradation and USDA soil texture classification or certification that the soil mix meets MnDOT specifications or other requirements. Samples of the mixed product should be also provided to the designer two weeks prior to delivery of media to the site. The designer should review the materials as soon as possible to avoid any potential delays in the procurement and review of another media source should the initial submittal not meet specifications. All accumulated sediment and silt from the bottom of the infiltration area should be removed prior to the placement of infiltration media. The contractor should make every effort possible to place the infiltration media in a way to minimize compaction of the subgrade and the infiltration media itself. No construction vehicles are allowed in the infiltration area after the media is placed unless approved by designer. Decompaction should occur if the subgrade has been compacted by construction equipment or supplies. Loose placement of infiltration media shall be accomplished by dumping from the edges and spreading with the bucket of a backhoe, which is outside of the infiltration area, or some other acceptable means determined by the designer. If spreading with a backhoe is not possible for the entire area of the infiltration area, only tracked skid steers or other low ground pressure equipment should be permitted in the basin to spread the infiltration media. This method should be minimized as much as possible. Travel over placed infiltration media should be strictly prohibited. The contractor should overfill the infiltration media areas approximately 20 percent to account for consolidation of the loose soil once wetting occurs. Any small irregularities at the designed finished grade should be worked out with hand tools. The contractor should contact the designer upon final placement of media for a final inspection prior to planting and mulching. At this inspection, the designer should check thickness and grades after soil wetting occurs and notify the contractor of areas that do not meet the tolerances specified. Tolerances in final grade are commonly vertically +/- 0.1 foot and horizontally +/- 0.5 foot. After final placement of infiltration media has been approved, planting or seeding should happen as soon as possible to avoid erosion, sedimentation, and the establishment of weeds. The contractor should notify the designer at least four days in advance of when planting or seeding will occur in advance of delivery of materials to the site to allow for scheduling of site inspections. At least two weeks prior to the planting or seeding dates, any existing weeds should be thoroughly eradicated mechanically or with herbicide within the project area. Warning: Seeding maintenance requires specialized knowledge and experience in plant and weed identification. Ensure a thorough maintenance plan is established prior to construction and that budget has been allocated for at least three full growing seasons and preferable longer. Native seedings can be more difficult than containerized plantings to establish. Applying mulch is an important tool for preventing weed establishment and retaining moisture for the plants or seed. Twice-shredded hardwood mulch is readily available and appropriate for use in plantings that use contained plant stock. Straw or native grass cuttings are very effective on sites that have been seeded. The NPDES permit requires all stormwater treatment systems to meet all permit requirements and be operating as designed prior to submitting the NPDES notice of termination. 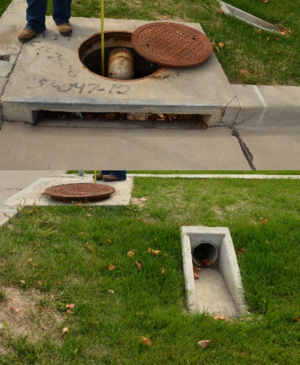 This can be accomplished by infiltration rate testing or by observation that all water in the stormwater practice draws down in 48 hours or less. It is highly recommended that all infiltration areas are tested prior to project close out, even if an NPDES permit is not required. MnDOT projects requires at least five tests per acre of infiltration area and a minimum of five tests per infiltration area. Infiltration rates shall meet or exceed double the design rate assumed. The test results from a MnDOT project must be submitted to MnDOT. When a final construction inspection has been completed, log the GPS coordinates for each facility and submit them for entry into the local BMP maintenance tracking database, if available. Additional information on construction of infiltration practices can be found on the Construction Specifications for Permeable Pavement page. This page was last modified on 9 July 2018, at 08:09.